Hailing from Australia’s sun-drenched shores, ECOCOCO is the eco-friendly, coconut oil-infused range that will transform your skin from top to toe. Gliding on evenly and effortlessly, this luxe lotion is the easiest way to achieve a gorgeous, streak-free tan (and you can easily build colour with extra applications). Thanks to the star ingredient, 100% certified organic coconut oil (alongside vitamin-rich açaí berry) the formula imparts incredible moisture, hydrating skin to ensure the seamless, gradual fading of your tan – not a scaly dry patch in sight! There’s a new policy on our ‘Tanifesto’ – and we’re sticking to it religiously! Starring a unique blend of natural and certified organic ingredients, this hyper-hydrating, radiance-boosting Self Tan will get your skin to its smooth, glowing even best while building a beautifully bronzed, dark-toned tan. 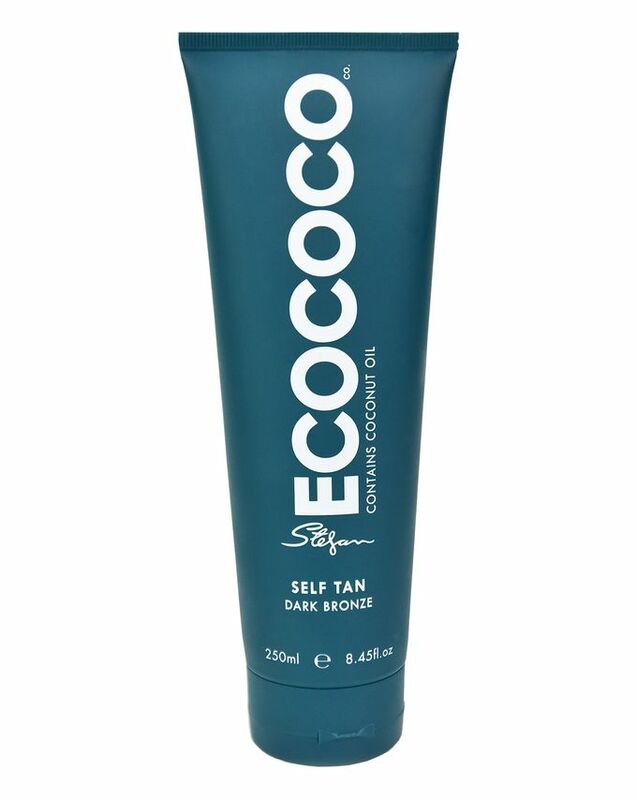 The quick-drying formula smells gorgeous (a tropical chocolatey coconut ‘eau de holiday’ scent) and doesn’t contain bronzer – that means zero transfer while your tan develops. Enriched with ECOCOCO’s signature ingredient, 100% certified organic coconut oil, the luxe lotion is also proven to hydrate and moisturise skin, ensuring the seamless, gradual fading of your tan. Boosted with vitamin-rich açaí berry and soothing aloe vera and chamomile, it can be used on face as well as body and is suitable for sensitive skin. To achieve flawless results, prepare your skin using an exfoliating glove or one of ECOCOCO’s sublime scrubs. Squeeze a small amount into the palm of your hands. Apply tan evenly, using firm circular motions. The tan will continue to develop over 6-8 hours. Avoid showering in this time. Wash hands thoroughly after application. Allow tan to dry before dressing. Carry out a 24-hour patch test prior to use. Discontinue use if irritation occurs. Do not apply to broken or irritated skin and avoid contact with eyes. Store below 30 degrees. This product does not provide SPF protection. Now I know why this has been on sale and never been sold for such a long time: beacause it's terrible.The worst product ever! It literally stinks! My whole appartment stinks like it after i apply it... How could you wear it?!? How could you wear it and leave the house for a date!? It is NOT a tanner, it just temporarily colors your skin in an unpleasant fake tanned colour. If suddenly starts raining and you're in bare legs... Oh boy! You risk it coming off and ruining your clothes (as well as embarrassing yourself in front of people). I should've listen to Miss' opinion: she's right, don't waste your money on this, not even now that's on sale! I do not recommend buying this product, because it is absolute waste of money. It barely does anything, and I am talking about a product which states “ULTRA DARK TAN”. Used it overnight and it did almost nothing to my skin. When you apply it, it looks very nice, but once you wash it off, everything washes off. Do not waste your money on this, there are many cheaper and most importantly TANNING products. Contrary to popular belief I think this is a great product. I read a lot of negative reviews on other sites after I ordered. But have to disagree! If you are looking for a super deep long lasting tan, this is not it. But it does provide a really nice, natural bronze colour that covers imperfections and makes skin look healthy. I even like to use on my face - it doesn't cling to dry patches and pimples. Give it a try if you want natural results.